2013 is the year when mobile takes off. Deployment of social collaboration continues, but adoption lags, especially for “disruptive” social capabilities. Enterprise social networking is on the runway, but has not lifted off. The digital workplace – a very busy place with new capabilities and much experimentation – is more fragmented today than 12 months ago. 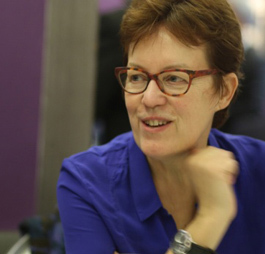 The senior management role in the digital workplace is less symbolic and more operational. Information security is a key concern and limits digital workplace development in certain areas. Early adopters are also early to the cloud. Middle managers resist as the change begins to happen. Change facilitation is not yet a priority but rapidly becoming one. The digital workplace is transformative. The digital workplace is an integral part of how organizations are transforming their ways of working towards greater collaboration, open innovation and mobile and real time reactivity. Senior managers in the early adopters understand this. They participate and act as role models and are often the driving force behind digital workplace initiatives. Experimentation for some, adoption for others. 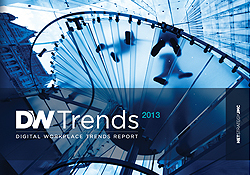 2013 is the year of digital workplace awareness and experimentation for the majority of enterprises. For early adopters, it is the year of change facilitation. Change facilitation and new styles of leadership are more critical than the digital workplace platform and capabilities. The survey looked at these angles as well, when defining the “early adopters”. Digital workplace initiatives are integrated into formal enterprise transformation programs. This is especially true for “floor-field” organizations where 30 percent either have a specific program dedicated to their digital workplace initiatives or have integrated these initiatives into a formal enterprise transformation program. Just under 20 percent of “desk-office” organizations have done this. Sixty percent of organizations consider mobile to be important and have already made “significant” or “some” investment. Last year the figure was just under 40 percent. Nearly 90 percent of early adopters have already invested and plan to continue. BYOD (bring your own ‘mobile’ device) is well established in early adopters where many provide BYOD technical support to co-workers. Forty-five percent of organizations offer either no mobile or simply access to email. One third offer “basic services” such as calendar, directory and news. Only 20 percent have mobile access to work tools for collaborative, HR and other task-related needs. Adoption lags far behind deployment for the social capabilities that empower individuals and self-organizing communities and challenge traditional hierarchies and roles within organizations. These include capabilities such as commenting, user-generated content, internal crowdsourcing. Enterprise social networking is deployed in 70 percent of early adopters and 35 percent of the majority and has not yet reached a critical mass of usage even for most of the early adopters. However, the proportion of organizations that say they have “no plans for social networking” has dropped radically from 38 percent just 12 months ago to 7 percent at the end of 2012. Coordination and governance are lacking, which is not surprising, as policies and guidelines have not yet been put into place. This may be compensated for over the next few years because information organization (information architecture, taxonomies and tagging) is the second highest priority for investment in 2013 and 2014. The transformative process is just beginning and has not yet impacted most organizations. The social collaborative dimension lives apart from the managed dimension for most organization. Nine percent have begun to integrate social capabilities into their enterprise processes, thereby fundamentally rethinking how they work. This figure reaches 22 percent in the early adopter group. Digital Boards with high-level senior participation are less common than 12 months ago. This is balanced by the fact that senior-level stakeholders have become more active in ensuring that their services are delivered to the workforce via the digital workplace. This is the case for 71 percent of early adopters and 41 percent of the majority. “Customer confidential information compromised” is the top major concern for organizations (50 percent) followed by “employee accidentally shares confidential information” and “penetration by external individuals”, both at 40 percent. They, like the majority, say cost is a major reason. However, early adopters also emphasize flexibility and reliability. Usage of the cloud varies depending on the sector of activity with 70 to 80 percent of organizations in education, software and industrial manufacturing saying the cloud is “relevant” for them. The greatest resistance to new social collaborative ways of working comes from senior management for the majority of organizations but from middle management in the early adopters. Major concerns are lack of business value and wasting time. Most organizations where there is resistance to social collaborative ways of working report slow success in overcoming resistance. Interestingly, education, training and change management are areas where only 14 percent of budgets is spent. Organizations report that the most effective change driver is “colleague and peer” behavior.